Ok. So it’s just sausage with noodles and cabbage. I tried to make the title as German as possible. If there’s a German equivalent to Spanglish that would be it. I started with 2 sausages: Weisswurst and Smoked Bratwurst. I marinated them both in Brooklyn Brewery’s Oktoberfest beer. I made hot dogs with them using a pretzel bread. 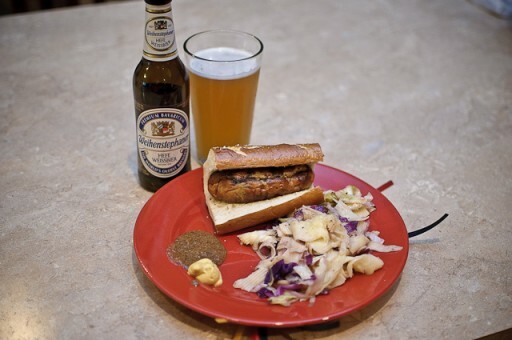 A German hot mustard and a Bavarian style sweet mustard made excellent finishings. Next I made noodles and cabbage. I first sautéed onions in olive oil. Then I added the cabbage, a little red wine vinegar, salt, pepper and Hungarian paprika. I tossed the noodles and cabbage mixture with the noodles and a little butter. Finally I topped it off with a shredded German cheese. I was not familiar with German cuisine at all before this battle. Except for beer and sausage. The noodles and cabbage didn’t look great or sound great, but it was really good. Paired with Weihenstephaner it was quite nice. Check out germandeli.com for some cool German food. 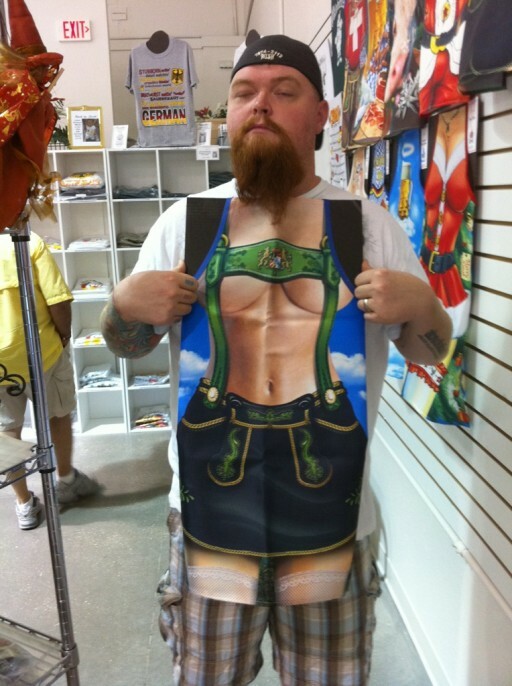 This is the apron I bought to keep me inspired. Although I look drunk or high in the pic I confess that I was of sound mind and body when posing and subsequently purchasing this apron. I’ll have to try the cabage/noodle combo next time. Well done! Yum brooklyn oktoberfest! Nice choice. I also like the multiple mustard pairings. That was a good idea. LOOKS GREAT! but we need to see on the actual grill.